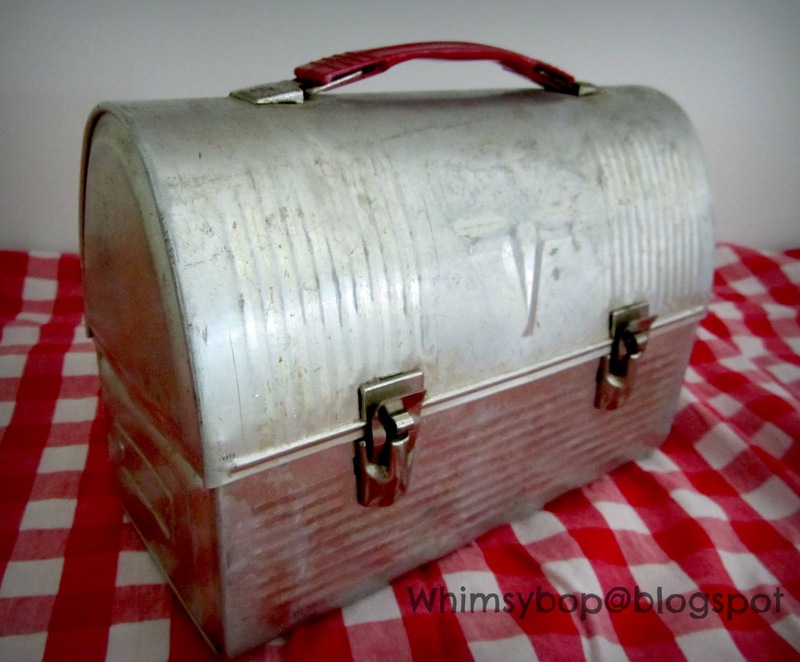 Whimsybop: Collecting vintage lunch pails: Zeb Witherspoon made me do it! 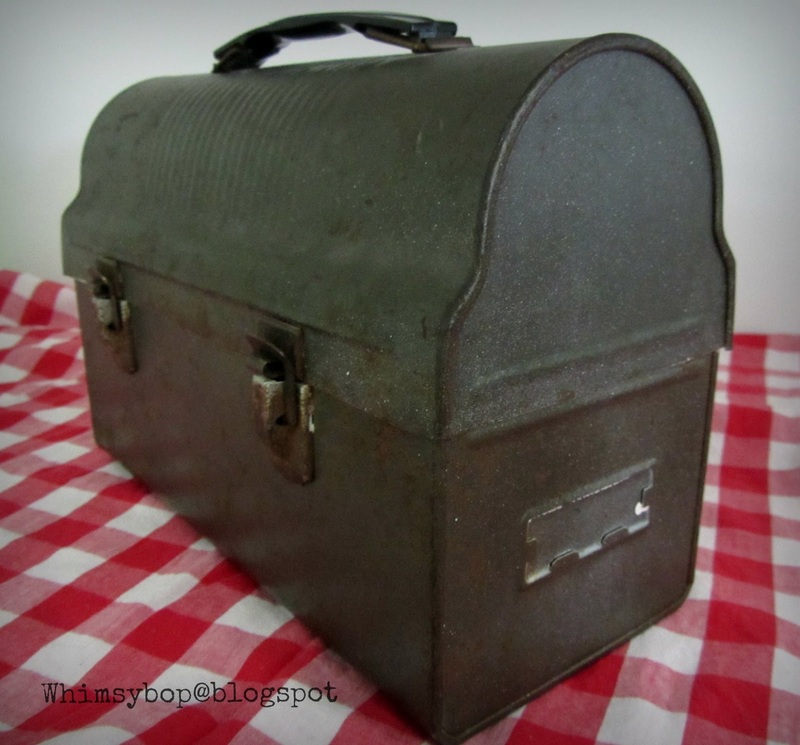 Collecting vintage lunch pails: Zeb Witherspoon made me do it! I've been collecting old lunchboxes for many years now. I love the fun & colorful ones from my childhood but I'm also drawn to these old ones from the good old days. 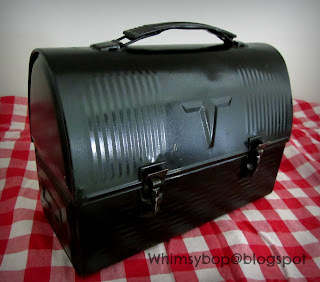 I started to appreciate these old lunchboxes when my brother-in-law, R.V. 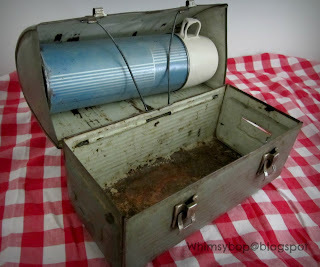 first showed me the lunchbox that once belonged to his father who had passed away decades ago. Like a museum curator, R.V. 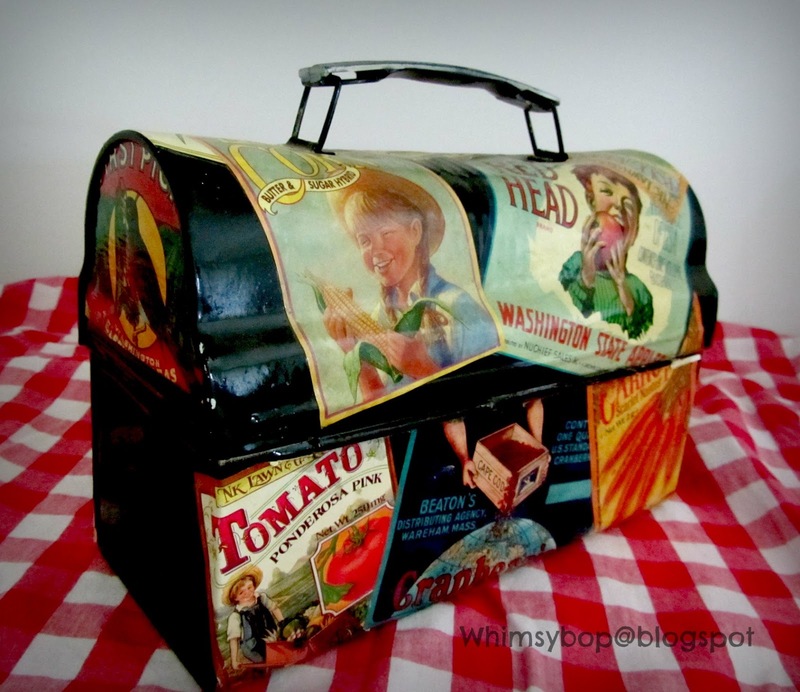 carefully handled his dad's lunchbox as if it were a valuable artifact. He turned the lunchbox to show me what his dad had carved into the side: "ZVW" - the initials of Zebulon Vance Witherspoon. He slowly and gingerly unfastened the two clasps which kept the box tightly closed. When the lunchbox opened we were greeted with the faint aroma of smoked meat. 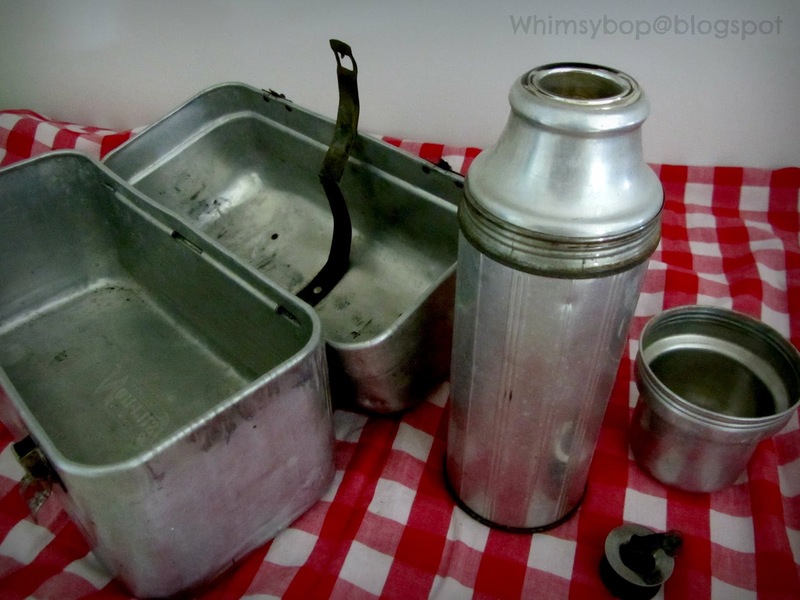 "Daddy made his own lunch every day which was always two slices of white bread with home-cured country ham. You can still smell it, can't you?" I shook my head in agreement and found myself speechless and almost tearing up from the unexpected emotion of sharing in the sacredness of a son remembering his father. My eyes were drawn to the thermos bottle, still tucked behind the wire loop in the lid after all these years. 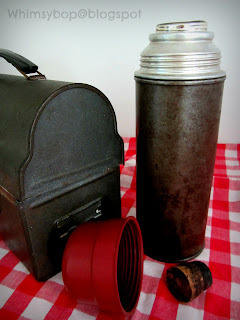 "Daddy always took a thermos of black coffee with him. The inside of it is stained brown and still smells of coffee," he informed me with the knowledge of a tour guide and the nostalgic heart of a son. I learned a great deal about Zeb Witherspoon that afternoon; how he learned his trade as a young man working construction in the Civilian Conservation Corps on the Blue Ridge Parkway in the late 1930's. He later supported his family as a carpenter working near Asheville, North Carolina; working large construction jobs in his younger years and as a handyman in his later years. He and his wife Willa had R.V. later in life; Zeb died at the age of 73 when R.V. was only twenty years old. This lunchbox served as a link to a son and his father. As I listened to the tale of Zeb Witherspoon, told with such admiration and love, I felt a bit sad and even a little jealous that I didn't have such a treasure from my own father - so like any collector would do, I went out in search of one! Some people save the whales and some people save trees - I shamelessly save old lunchboxes and bring them home every time I find one, I'm thankful to have married a man who doesn't mind this weird habit of mine. I am happy to announce that I now have a modest collection of other people's father's lunchboxes! It didn't take long to realize that my quest wasn't so difficult after all. I have found mine through the years at yard sales, flea markets and thrift shops and usually spend between $3 - $12, depending on the condition and whether or not there is a thermos inside. I can always find them in antique malls too, but their prices are so high that I doubt they really want to come home with me. Due to the dome lid at the top, the only way to display these lunchboxes is side by side on a shelf (mine are perched on the top shelf in my laundry room). The benefit of having a shelf full of these old lunchboxes is that they are extremely useful when it comes to storage - it's easy to be organized when you have a lunchbox for: batteries, first aid supplies, pedicure tools, coupons, my stash of practical jokes (it's important to know where to locate the rubber doggie doo, plastic ants & cockroaches at a moments notice! ), and my secret supply of peanut M&M candies (shh, don't tell!). 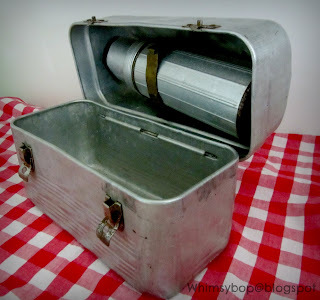 I have a silver lunchbox marked "Barber Shop" where the hair clippers and accessories are stored for my husband's monthly haircut, a black one where I keep my sharpies when I leave the house to doodle, and a silver one with a leather strap (a handle repair) that stays in the car with granola bars and bottled water just in case anyone needs a snack while away from home. My first purchase was a rust bucket, but I couldn't pass it up, (it was cheap). 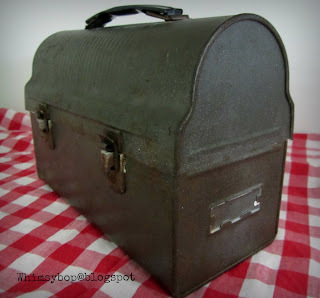 I am ashamed to say that I altered it to suit my needs: I took it home and gave it a good cleaning, put a shiny coat of black spray paint, modge podged a few old labels on it and presented it to my Mom as a gift to keep her flower & vegetable seeds inside, (which she loves and still uses to this day). That was the last time I altered one because after my arts & crafts project was finished, I was riddled with guilt for defacing something older than I am. From that point forward I decided to love them in "as is" condition, rust and all - and believe me, I do! What an interesting hobby. I'm not one to collect anything -- but after reading this I almost feel like I should. Totally charming. I love that they still have usefullness. What a great, unusual collection to have! And a perfect place to display them! I like them old and rusty but I also love how you fixed the one up for your mother! Thanks for visiting my blog and I am now a new follower of yours!